The largest professional social network, LinkedIn, has officially been banned in Russia . The country’s communications body, Roskomnadzor, has placed LinkedIn on a blacklist of websites. ISPs (Internet Service Providers) in the countries will be forced to block access to the website. The recent court decision comes as a result of legislation that was first enforced in Russia in 2014 that made it mandatory that all internet companies have to store Russian users’ personal data on servers located in Russia. If those servers are located outside of the country, and they contain the personal data on Russian users, those sites would be blacklisted. Thus, LinkedIn is the first casualty of the ruling. Other Silicon Valley giants like Apple, Google, and Amazon have since the legislation stored Russian users’ data on servers located in Russia. However, not all tech giants have complied. Specifically, Facebook and Twitter have yet to comply with the Russian ruling, and fears are that they will be the next casualties. In fact, many suspect that banning LinkedIn, which is not the major social network, is a warning signal to giants like Facebook and Twitter. This is, then, being used as a clear message that the Russian authorities are willing to sever ties to tech giants in order to gain greater control of Russian users’ private data. What law are they violating? The legislation in and of itself is in fact not without controversy. Russian authorities state that the law was aimed at protecting Russian users’ online privacy against hackers. In fact, LinkedIn has a history of mass hacks, such as the 2012 LinkedIn hack that affected 117 million people . However, critics suggest that Russia has ulterior motives for the law. The other possibility, they state, is that Russia would like to have greater control of those users’ data. Specifically, with the new rules and tech companies’ compliance, Russian authorities could force companies to give up this personal data about Russian users. It would then be a greater ploy to gain access to Russian users’ data that is now being denied to them by companies such as LinkedIn, Facebook and Twitter. At this moment, Russian authorities cannot, or find it legally complicated, to force these tech giants to give up users’ data, as their servers are not located in the country. LinkedIn only has 5 million Russian users, compared to the 467 million global users. Therefore, there are reasons to believe that it will stick to its denial of the Russian rules. However, since the company is being bought by Microsoft (which has a vested interest in smoothing out problems with Russia) for $26.2 billion by the end of the year, there may be pressure for it to comply fully. Facebook has at least 24 million Russian users (compared to 1.8 billion monthly active users globally ) and Twitter hasabout 8.5 million (317 million globally ). Essentially, Facebook and Twitter’s Russian users comprise only a small percentage of their global audience (more so for Facebook). It will be interesting to see whether they follow LinkedIn in refusing to comply with Russian legislation (and essentially give up those users), or whether profit trumps principles and they give in. What can Russian users do? 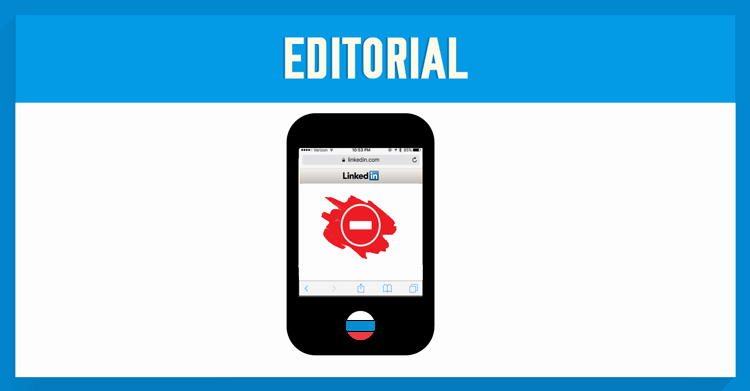 For Russian users on LinkedIn, which is the number one place for professionals to gather, discuss, network, and find jobs through those networks, there are ways around Russia’s ban. Since these ISPs work by allowing or blocking Russian IP addresses from accessing a website, you can use a VPN (Virtual Private Network) to hide your true IP address. A VPN works by establishing a secure connection to a server in a country of your choosing, and sending all traffic through that server to the destination. So, for example, if I’m in Moscow and want to connect to LinkedIn, I can first connect to NordVPN’s server in the US. Once my connection is established, the VPN then encrypts all my data before sending it on to LinkedIn. Now, I’m not accessing LinkedIn from a Russian IP address, but an American one. It is important to remember, however, that the best VPNs are not free. In fact, Free VPNs sometimes have shady practices (i.e. data sold/used for ad purposes), or slow connection speeds, and you generally get what you pay for. If you pay nothing, you’ll get pretty much that in terms of quality and support. NordVPN on the other hand has Double Data Encryption servers in Russia (encrypted not once, but twice), great speed, and flexible pricing. VPNs will be the best way for Russian users to access these and other blocked websites, and with Facebook and Twitter soon to be targeted, will be the only way to access international social sites.